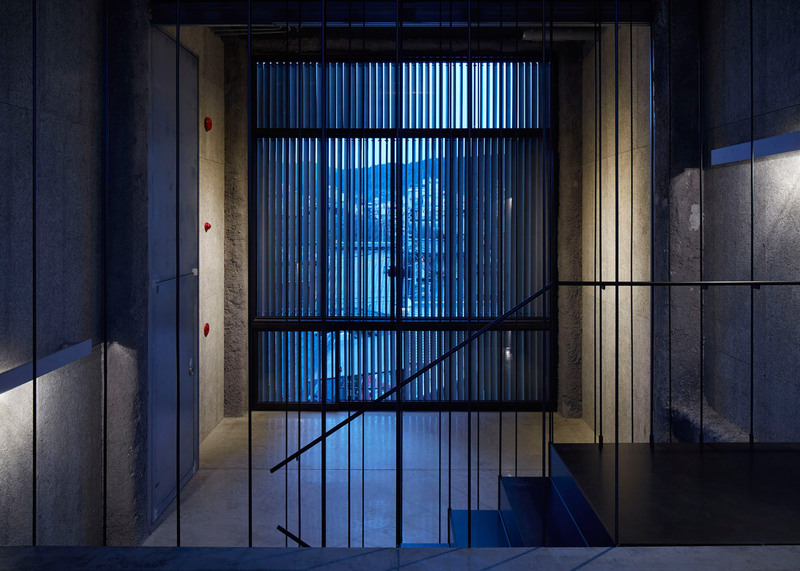 German architect Florian Busch conceived this Kyoto bar as one continuous space spread over eight levels to make the most of a narrow site in one of the city's oldest nightlife areas (+ slideshow). 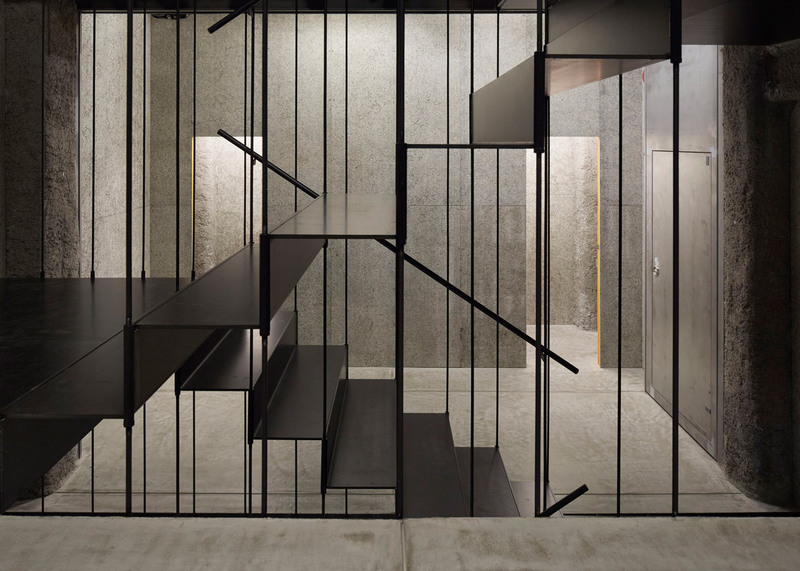 Each level within the K8 bar is connected via a metal staircase and landings that are designed as one structure, zigzagging across the interior. 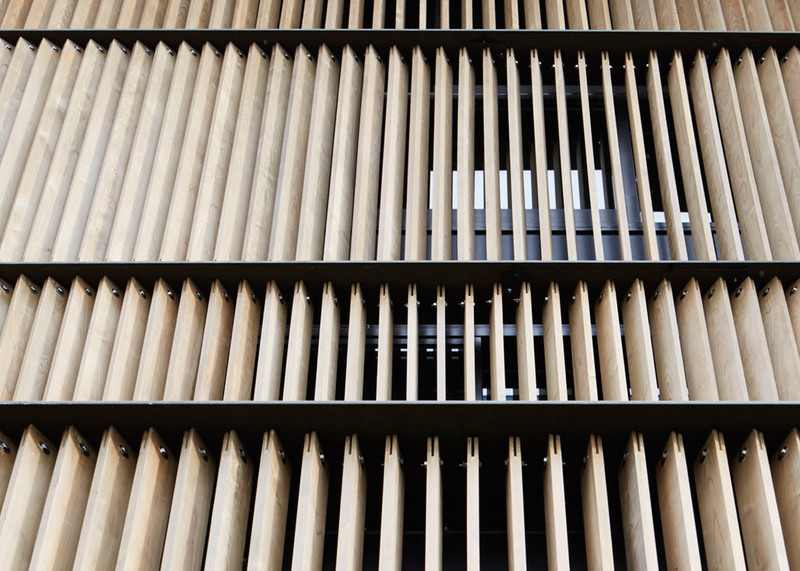 Hundreds of wooden louvres are arranged in seven sections of different heights on the facade to disguise the number of levels inside the building. They are angled to create a moire effect across the facade. "The building's interior is more concealed than revealed," said Busch. "Facing the building, one is left without a precise answer as to how many floors or how deep the building might be." 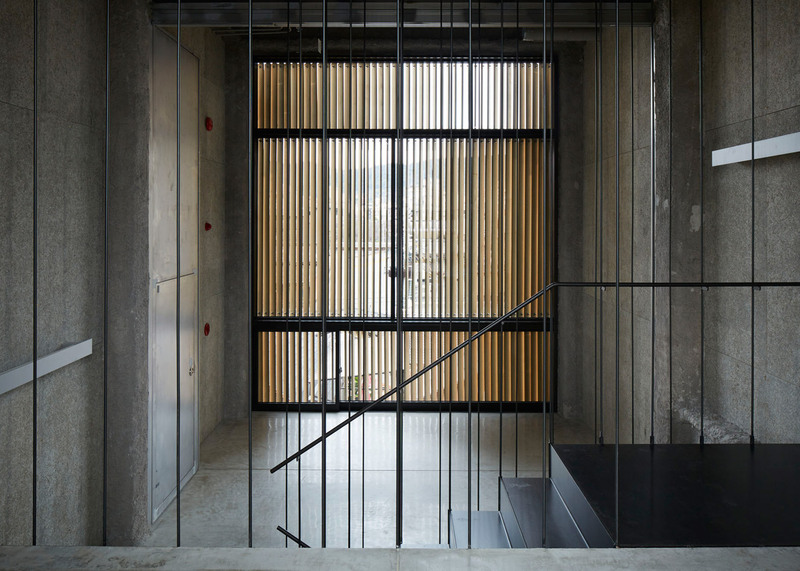 These louvres also allow natural light to filter in to the building without revealing too much about the activities of its occupants to passersby. "Towards the sides, the louvres are rotated to a degree that they almost appear to be a solid, albeit nuanced, wall," said Busch. "Towards the middle, varying degrees of transparency give subtle hints about the inside." "Walking by further sets the facade in motion, as if the building itself were moving around those who pass by, engaging them by revealing glimpses of the inside in varying depths," he added. K8 occupies a 50-square-metre plot near a bridge on Kiyamachi Street, which dates back to the 1600s and has been a well-known nightlife strip since the 1700s. According to Busch, the plot had previously been occupied by two crammed-in houses. The street runs parallel to the Kamo River, and adjacent to the nightlife district of Pontocho, where Busch said a "vibrant mixture of bars, brothels, inns, dwellings, shops have for centuries created an urban atmosphere of essential Kyoto nightlife". As the area is of historic significance, planning regulations were introduced to protect an eastern part of Pontocho from over-development, resulting in most low-rise buildings. But K8 is located in an area where the regulations are less strict, so buildings reach up to six storeys. "K8 is on a narrow site perched between two such tall buildings representing the days when the area was declared open frontier and quick money was put in erecting, at best, nondescript mediocrity," said Busch. K8's interior arrangement makes the most of the height restrictions by creating off-set levels supported by a steel structure. 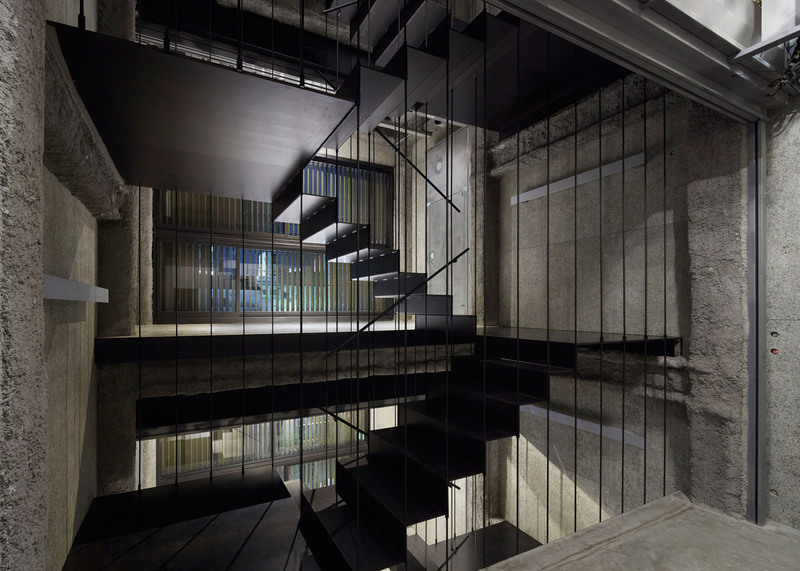 Each level has walls made from board-marked concrete and a polished concrete floor supported by a metal deck-plate, left exposed on the underside to create the ceiling on the floor below. 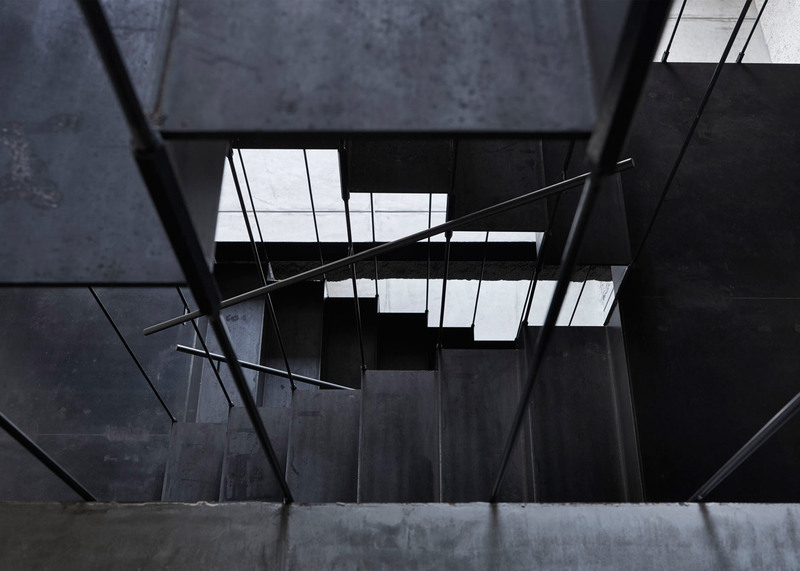 The black staircase rises up through the middle of the structure. It was prefabricated in sections from landing to landing, and welded together on site. The architect made a conscious decision to create a tall building with no elevator, which he felt would divide the space up too much. "Where Pontocho is experienced as a horizontal sequence of encounters, K8 is the translation of that experience into the vertical," said Busch. "Here, the evening evolves as a gradually changing course of events, from aperitif on ground level to digestif on the top overlooking Pontocho towards Kamogawa, the staircase linking a diversity of in-betweens." Florian Busch founded his Tokyo studio in 2009, following four years working at Toyo Ito's firm. He moved to Japan after studying at the Bauhaus University Weimar in Germany and the Architecture Association in the UK. Busch's previous projects include a Tokyo office block scattered with square windows. Photography is by Nacasa & Partners.